“Some 85 species of North American birds excavate nesting holes, use cavities resulting from decay (natural cavities), or use holes created by other species in dead or deteriorating trees. Such trees, commonly called snags, have often been considered undesirable by forest and recreation managers because they are not esthetically pleasing, conflict with other forest management practices, may harbor forest insect pests, or may be fire or safety hazards. (Click on most photos for full sized images). “Many species of cavity-nesting birds have declined because of habitat reduction. In the eastern United States, where primeval forests are gone, purple martins depend almost entirely on man-made nesting structures. The hole-nesting population of peregrine falcons disappeared with the felling of the giant trees upon which they depended. The ivory-billed and red- cockaded woodpeckers are currently on the endangered list, primarily as a result of habitat destruction. This is one of my favorite videos from National Geographic showing the incredible fledging of the Wood Ducklings. Talk about cute! Many of these birds like the Bufflehead and Wood Duck are secondary cavity nesters, meaning that they don’t excavate their own tree cavities but use those made by other birds, predominately woodpeckers. Surprisingly the Nuttall’s Woodpecker (Picoides nuttallii) male excavates their nest cavity with little assistance from the female shown above feeding the nestling. However, both parents brood and feed the nestlings for about two weeks until they are ready to leave the nest like this youngster. Many of the secondary cavity nesting birds will also use artificial nest boxes giving them a much better chance at survival in the world of dwindling natural cavities. and one of the nestlings getting ready to fledge. and the rather determined looking chick peeking out the entrance. and, of course, the young one ready to take on the world! then, at the ripe old age of 17 days, what’s going on out here? The White-breasted Nuthatch (Sitta carolinensis) is also a familiar cavity nesting species to many. Their nest is typically built with a base of bark strips and flakes with lumps of earth; with a cup of finer bark shreds, grasses and rootlets, but mainly lined with fur. This pair was bringing in relatively large sticks, probably laying down a platform in a large cavity in this oak tree before building the bulk of the nest. These are nestlings, just a few days old, in their comfy, fur-lined nest, begging for food. and its well fed nestling finally peeking out the cavity entrance. and the nestling, just emerging from the nest to be fed. According to the literature, Peregrine Falcons and Merlins both nested in tree cavities until the end of the 19th and early 20th centuries when most of the great trees were felled. Now the only falcon that regularly nests in natural cavities is the smallest and most common falcon in North America, the American Kestrel (Falco sparverius). I was fortunate a few years ago to help with some banding of these beautiful raptors. This is what the chicks look like when they’re old enough to band at about two weeks of age, half way through their nesting phase. Notice the chick in the upper left corner. It has rolled on its back and presented its talons in typical defensive behavior. The majority of our owls in North America also nest in cavities and I want to wrap this up with a few of my favorites, starting with the Barn Owl (Tyto alba). Like many raptors, the female Barn Owl begins incubating when the first egg is laid resulting in an asynchronous hatch. Therefore you see owlets in different stages of development in the nest box. Great Horned Owls (Bubo viginianus) are a favorite of mine and I have been fortunate to observe a pair of these magnificent raptors raise their young in a nearby natural cavity in a huge oak tree. The owlet looking up to the parent bird is the one currently being fed. These young owlets have been banded (and are seen here in an artificial nest box) to help with the continuing struggle to bring them back from the brink here in the West. If you want to see baby bird photos of my favorite passerine, you will have to look “Somewhere Over the Rainbow” where the nestling, fledgling and juvenile Western Bluebirds live. If you want to download the PDF file quoted at the beginning of this post, simply click on the link in the references below. References: 1Scott, Virgil E., Keith E. Evans, David R. Patton, and Charles P. Stone (1977). Cavity-nesting Birds of North American Forests. U.S. Department of Agriculture Handbook. 511, 112 p.
Thank You! This made my day!This is absolutely wonderful! I have ‘my’ Mama / Papa Blues(WEBL) nesting in our nest box now, second brood. First in May-June: 6 eggs/1 not viable/ 5 fledges. Now, 2nd nest-only 3 eggs. Is that ‘normal’ since this is a second nest/brood? Great post Larry! Those Bufflehead ducklings are darn cute. I love the look the young Burrowing Owl is giving, priceless. @Mary Jo I always feel especially blessed when my Bluebirds raise a second clutch! The first clutch is almost always larger than the second as the entire process is pretty taxing on the adults. My second clutches are usually four eggs but three is not rare. Good luck with your “blues.” It sounds like they are doing very well, plus you get all of that entertainment! @Keith thank you very much! OMG! That is a great cavity post. I hope you have some pictures left for the next one. thanks for sharing and such a great effort. Outstanding images Larry!!! What a treat for us all who pay you a visit! I’m truly left speechless. 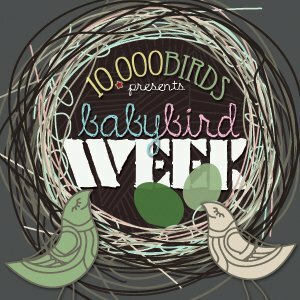 The new week’s linking is up if you care to share a new bird post….thanks for linking up last week. @Anni thanks for stopping by to see my baby birds! Where Are You Birding This Second Weekend of August 2012?